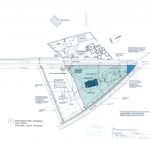 Architecturally designed, five bedroom family residence. 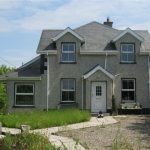 Located 40 mins drive off the N11, this property is ideally positioned, tucked into the hillside C.3.5km from the expanding village of Tinahely. The property which is a 4 minute walk from the renowned Ballybeg House wedding venue, could offer good potential as a B&B due to its surroundings and location, adjacent to the walkways around Tinahely village including the Wicklow Way and the Railway walk to name a few The property which is architecturally designed has been enjoyed by its current occupiers since it was built 20 years ago.This should prove an ideal home for somebody wanting a bright spacious dwelling, designed to a spectacular standard with all the comforts of modern day living. Services: Power Supply, Mains water, Private sewerage system, oil fired central heating, water heating and phone point. Directions: From the centre of Tinahely village, proceed down to the bottom of the village, cross the bridge and at the Tinahely Business Centre on the left hand side, keep left up the hill. After approximately 1km pass Kilaveney church on right hand side. Continue straight on for 1.7km. There is a white cottage on the left hand side with its gable end on the roadside, turn left up the lane at this cottage and the property is the first entrance on the left hand side with for sale sign. Hall/Reception Area: 19`9 ``x 9`5``(6.03m x 2.9m) Chinese slate tiled floor, solid fuel stove, vaulted ceiling. Kitchen: 19`3`` x 11`6`` (5.8m x 3.5m) Chinese slate tiled floor, fitted kitchen , spotlights, integrated double oven, ceramic hob, integrated fridge freezer, feature corner windows and velux roof window. 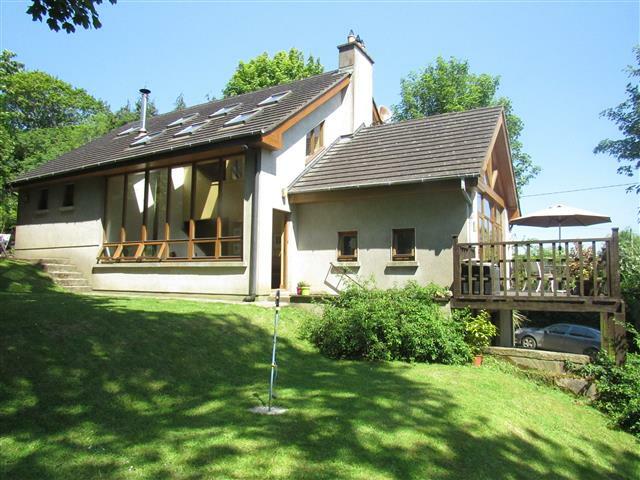 Living Room: 13`8`` x 19`4`` (4..2m x 5.9m) solid timber floor, open fire place, custom made fire place, vaulted ceiling, 2 sets of double glass doors, opening onto balcony with stunning views across the valley, fully glazed gable end. Utility Room: 7`9`` x 5`1`` (2.4m x 1.5m) Chinese slate tiled floor, plumbed for washing machine, fitted worktop, back door. Shower Room & Toilet: 5`3`` x 7`1`` (1.6m x 2.2m)whb, wc, Chinese slate tiled floor, free standing electric shower, shower area fully tiled. Office: 7`7`` x 10`8`` (2.3m x 3.3m) glass door opening onto decking, floor carpeted. Bedroom 1: 15`2`` x 10` (4.6m x 3.03m) timber ceiling, glass door opening to rear of house, floor carpeted. Bedroom 2: 14`6`` x 11`6`` (4.4m x 3.5m) glass door opening onto large deck area, floor carpeted, timber ceiling. Bedroom 3: 12` x 14`4`` (3.6m x 4.4m) solid timber floor, vaulted timber ceiling, glazed area overlooking reception. Bedroom 4: 16`4`` x 14`6`` (5m x 4.4m) solid timber floor, ceiling spotlights. Bathroom: 8`1`` x 7`2`` (2.5m x 2.2m) large family bath, whb, spotlights, tiled around bath.